Charmed, I'm sure!Whether on a necklace or bracelet, these dangle beads set in, and crafted with sterling silver will make a unique addition to any outfit, for people of any age. The themed styles and depictions can be enjoyed as items of faith, spirituality, telling the classic tales, or just as cute jewelry. Enjoy a lifetime of charming beauty and variety. Mix and match charms for an endless range of styles, statements and occasions. Or wear one on its own as a stunning, simple statement,. The craftsmanship will endure throughout your life and on the next generation, creating an heirloom your family will treasure Start creating your own style or a family legacy now, add Marina Jewelry's charm beads to your jewelry collection today. 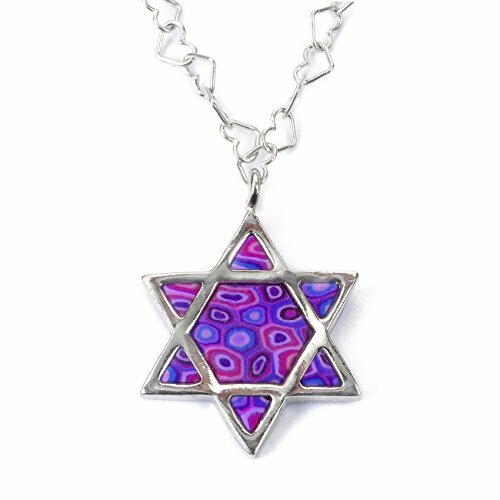 This Judaica 925 sterling silver Star of David necklace adorns the beautiful and symbolic Jewish symbol intricately created by hand using polymer clay. The handcrafted Star of David is an emblem of Jewish people, interconnecting the people, G-d and universe. Enchanted by a radiant choice polymer clay finishes and coated with enamel, you can be certain this exquisite piece of jewelry will remain as glorious as the moment you set eyes on it. The Magen David pendant, measures 0.8x0.8 inches, 2x2cm, and sweetly suspends from a 16.5 inches, 42cm 925 sterling silver chain. Choose from Multi-colored millefiori flowers, turquoise-colored, purple, pink, mosaic-pattern or red polymer clay finishes. 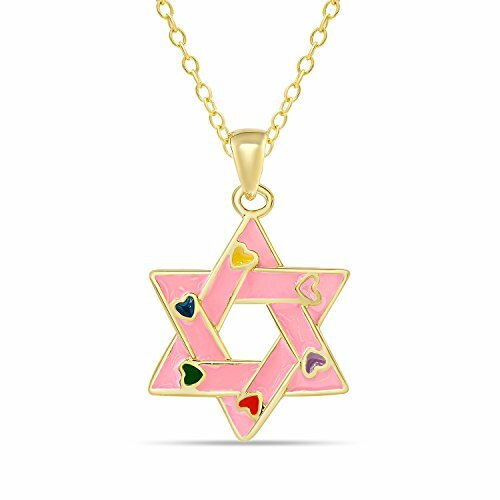 Add a special little touch to yours or her look with beautiful and colorful Jewish jewelry. A thoughtful and symbolic gift for any faithful follower, sure to leave a timeless and lasting impression on any special woman or girl, whether it be you wife, girlfriend, daughter or mother for Hanukkah, Bat Mitzvah's or a wedding anniversary, this charming faithful reminder will brighten her day. Lily Nily Star of David Pendant Necklace for Kids is the perfect little accent to your little ones outfit. 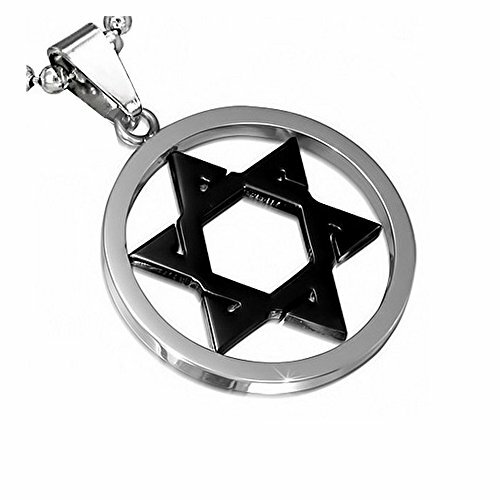 This beautiful and cute jewish star necklace is the perfect treat for your accessory loving little one. It comes in a beautiful shade of pink with a multicolored heart design. The adorable little star is a great idea for your little superstar. It's a beautiful enhancement to any dress and works for every occasion from casual to dress up. This will surely bring joy to getting dressed in the morning. FEATURES:• Hand-painted• Pink, blue, yellow, green and red enamel• Gold plated brass• High polish finish• Stylish and cute• Adjustable chain 14 - 16 inches• Lobster-claw clasp• Comes in a Lily Nily gift box• Makes A Great Gift! CHEMICAL TESTING FOR PRODUCT SAFETY.All Lily Nily products are nickelfree and are randomly tested to meet and surpass all CPSIA requirements for lead and cadmium content in children's jewelry.GIVE THIS AMAZING LILY NILY NECKLACE AS A GIFT THAT YOUR ACCESSORY LOVING LITTLE ONE WILL LOVE!This is an absoloutely perfect gift. Comes in a pink Lily Nily box with the adorable pink ribbon bow. It makes the perfect gift for just about any occasions including birthdays, graduations, Christmas and any milestone! 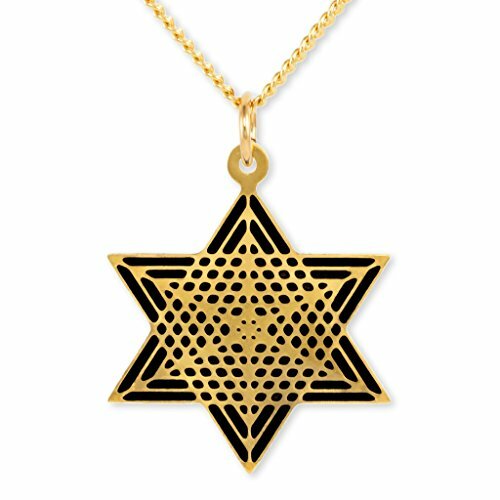 This unique Star of David necklace features a pendant with a laser cut design with ravishing finishes made from enamel in gold plated brass. 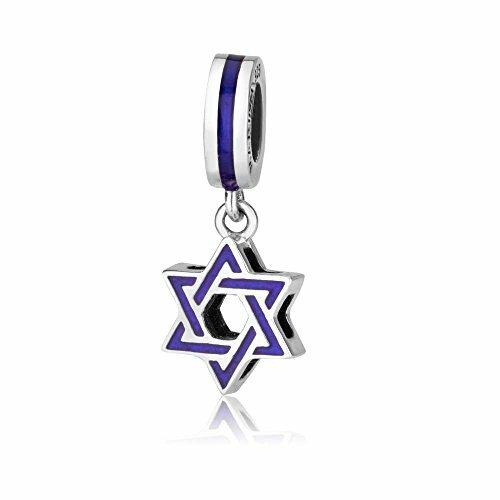 The charm, 0.9X0.7" (2.3x2.0cm), is of a Star of David, known as a sacred Jewish symbol and makes a meaningful religious token for yourself or a thoughtful gift for a loved one. This pendant necklace charms its owner with its thin, delicate and feminine design and is as durable as it is beautiful, remaining as impressive as the moment you or your loved one first laid eyes upon it. Attached to a 17.5" (44cm) high quality gold plated brass chain, and part of a brand new and inspired metal jewelry collection. This stainless steel jewelry is a perfect gift for a anyone. Get it for your loved one, or treat yourself for a classic timeless style. 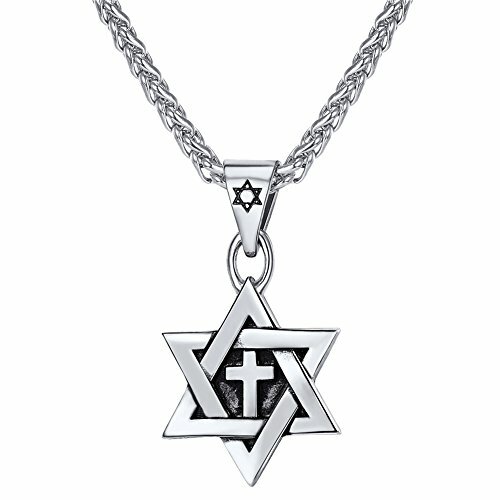 The pendant showcases an elegant style featuring a two-tone design accented with the Star of David set inside a circle. The pendant shines with the highly polished finish and smooth black enamel coating. The necklace is crafted of durable, highly polished 100% stainless steel. The durable chain measures 18.00in long and locks with a spring ring type of clasp for extra security. Show your religious devotion, and look and feel great with this exquisite necklace! 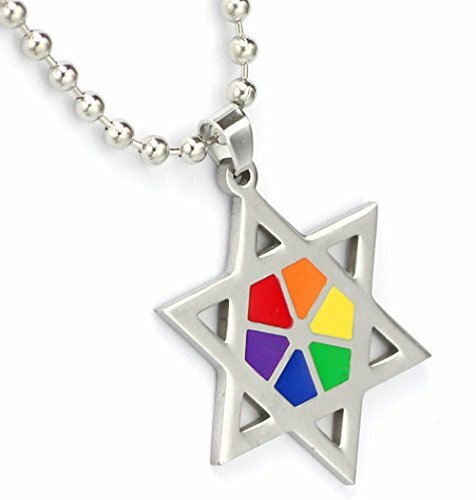 High quality (LGBT Judaism Lesbian and Gay Pride) Star of David Pride (Jewish) Necklace with rainbow colored enamel center. Pendant is approx. 1.5" x 1.5"- Includes 16" chain. This unique necklace features a hamsa pendant that is hand crafted with ravishing finishes made from enamel in gold plated brass. The pendant, 0.9X0.7" (2.4x1.8cm), is of a centering Star of David within a hamsa symbol, known as a middle eastern symbol for protection and is believed to ward off harm, making a meaningful religious token for yourself or a thoughtful gift for a loved one. This pendant necklace charms its owner with its delicate and feminine design and is as durable as it is beautiful, remaining as impressive as the moment you or your loved one first laid eyes upon it. Attached to an 17.5" (44cm) high quality gold plated brass chain, and part of a brand new and inspired metal jewelry collection. 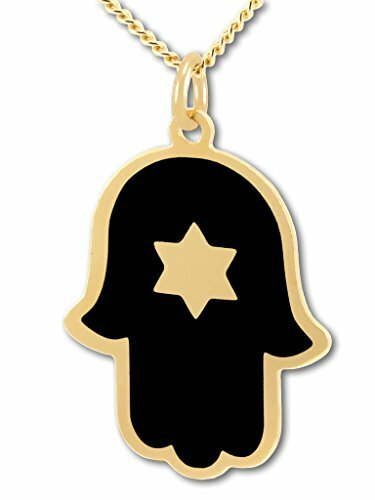 Looking for more Enamel Star Of David Pendant similar ideas? Try to explore these searches: Valentine Birth Announcements, Turtle Accent Lamp, and Chevrolet Small Trucks. Look at latest related video about Enamel Star Of David Pendant. Shopwizion.com is the smartest way for online shopping: compare prices of leading online shops for best deals around the web. 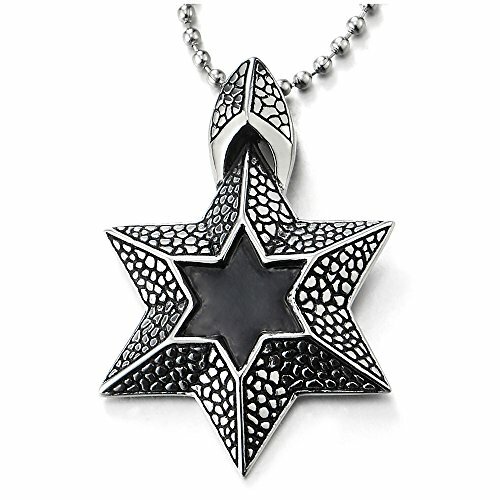 Don't miss TOP Enamel Star Of David Pendant deals, updated daily.